As a Legacy Society Member, you will have your name displayed on a permanent plaque at the MCSC’s entry. You also will receive a lifetime subscription to our monthly newsletter, “The Grapevine,” and recognition in a yearly special edition. At our annual meeting, we will provide a special portion in which we introduce Legacy Society Members who are in attendance. Your membership will be noted in the “Community Foundation of Snohomish County” annual report. Last, as the Legacy Society grows, we will be adding new ways for your membership to be acknowledged. However, the key benefit of Legacy Program membership is the simple yet profound knowledge that your commitment and generosity are helping people enjoy more independent, more engaged, and more valued lives. This is a wonderful gift for MCSC visitors and Members, our community, and for people who want to leave a lasting, positive statement of their commitment to the importance of Seniors in our future. 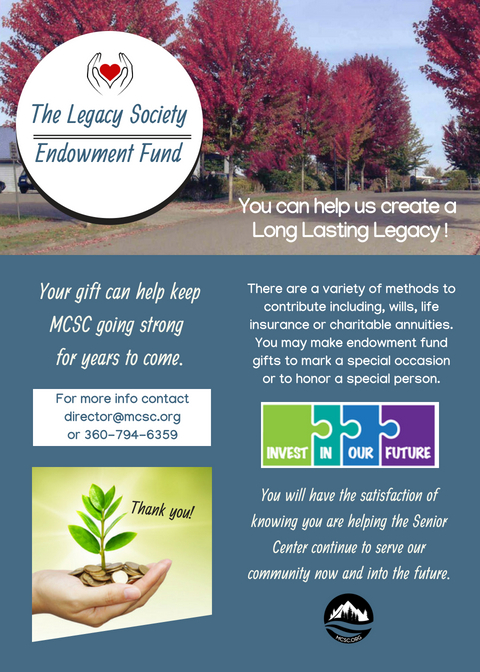 Thank you for considering the Monroe Community Senior Center’s Legacy Program. We look forward to the opportunity to speak with you personally.